Remember as Mr. Edwards on the TV series "Little House on the Prairie", French is one of the most endearing character actors of the 1970s and 1980s. He was a natural as a lovable sidekick but could also very effectively play a sadistic, menacing killer. Tall, burly and dark with curly black hair, usually with a beard and/or mustache, a pug nose and squinty, sparkling eyes he was a charismatic actor. He was born on December 4, 1934 in Santa Barbara, California, the son of a Hollywood stuntman. His father instilled in him a love for western lore and legend. His first job was working with his father in stunts on the "Gunsmoke" television series. He took courses in theatre arts at Los Angeles Valley College and Cal State Los Angeles and later auditioned for television roles. He worked on numerous episodes of "Gunsmoke" and other series. He met his good friend Michael Landon while appearing on "Bonanza" and a long friendship began. He later took to directing and directed many episodes of Landon's various series. His film credits included: "The Clown and the Kid" (1961) as 1st Patrolman, his film debut; "The Quick and the Dead" (1963) as Milo Riley; "Spencer's Mountain" (1963) as Spencer Brother; "Charro!" 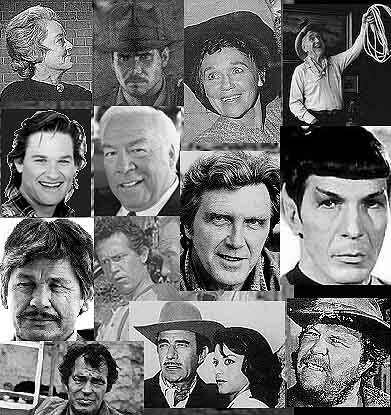 (1969) as Vince; "Death of a Gunfighter" (1969) as Phil Miller; "Rio Lobo" (1970) with John Wayne, as Ketcham; "There Was a Crooked Man" (1970) as Whiskey; "Flap" (1970) as Rafferty; "Chato's Land" (1971) as Martin Hall; "Wild Rovers" (1971) as The Sheriff; "The Other" (1972) as Mr. Angelini; "The Nickel Ride" (1974) as Paddie; "The House on Skull Mountain" (1974) as Dr. Andrew Cunningham and "An Officer and a Gentleman" (1982) with Richard Gere and Debra Winger, as Joe Pokrifki, his last theatrical film. On TV he was a regular on the TV series: "Get Smart" (1965-70) as Agent 44; "The Hero" (1966-67) as Fred Gilman; "Little House on the Prairie" (1974-77) and (1981-83) as Isaiah Edwards; "Carter Country" (1977-79) as Chief Roy Mobley and "Highway to Heaven" (1984-89) as Mark Gordon. He also appeared in TV movies including: "Cutter's Trail" (1969); "The Little House on the Prairie" (1974); "The Tribe" (1974); "Amateur Night at the Dixie Bar and Grill" (1979) and "The Golden Moment: An Olympic Love Story" (1980). He also guest starred on such TV series as: "Lassie"; "Gunsmoke"; "The Virginian"; "Hogan's Heroes"; "The Wild, Wild West"; "Batman"; "F Troop"; "Captain Nice"; "Bonanza"; "The Beverly Hillbillies"; "Mission: Impossible"; "The Waltons" and "Fame." He married actress Julie Cobb in the 1970s and they had three children Tracy, Kelly and Victor Jr. He collected western memorabilia and his collection included such items as Buck Jones' hat and Tom Mix's and Roy Roger's boots. He was an avid boxer and was a part owner of a boxing club in North Hollywood. He died of lung cancer on June I5, 1989 in Los Angeles, California at the age of 54.